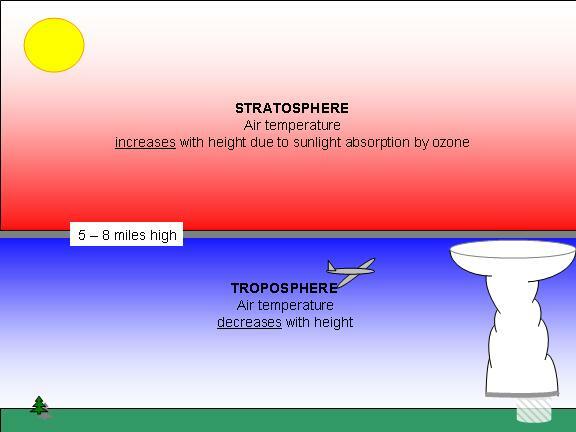 The stratosphere is the second major atmospheric layer above the troposphere, extending in altitude from about 8 to 30 miles high. No weather occurs in the stratosphere. The statosphere contains over 15% of the total mass of the atmosphere, and is where the ozone layer is located. Air temperature slowly increases with height in the stratosphere, in contrast with the troposphere where the temperature rapidly decreases with height. This unusual temperature structure is caused by absorption of sunlight by ozone. All weather stops at the top of the troposphere (called the tropopause), and the stratosphere is essentially cloud-free. If you see a tall thunderstorm with an anvil cloud, it is likely that the anvil cloud has reached the bottom of the stratosphere. At that level, atmospheric convection stops because rising cloudy air parcels are no longer warmer than their environment, since stratospheric air is relatively warm. AIRPLANES NOT ALLOWED Very few airplanes can fly as high as the stratosphere because the air is so thin that there is not enough lift to keep the aircraft supported. Some spy planes do fly in the lower stratosphere, however, such as the U-2 and the SR-71. Another exception to this is in cold winter air masses, when the stratosphere can lower to an altitude where airplanes can fly.